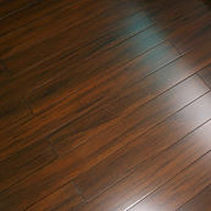 Laminate Flooring was a major feature of 1990s home decor. It is the cost effective alternative to real wood. The quality has also improved immensely over the years. Natural wood is the preferred, but less cost effective option. This can include planks or parquet, which allows for a variety of designs and detail. Another useful alternative are ceramic wood effect tiles, which require little to no maintenance. If you pop into your local high street store and have a quick look around the laminate flooring you will see some really good bargain deals. 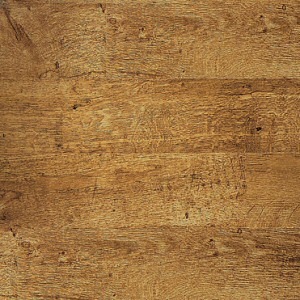 Unfortunately the cheapest laminate flooring is just that - cheap. This Quick Step Eligna Laminate Flooring Harvest Oak, is £27.53 for 1.77sqm, and is an example of the better quality that is available. Often in larger homes, carpeting is at a minimum downstairs - vacuuming can be a full time job! Tiles have long been popular for this purpose but a relatively new option are wood effect ceramic tiles. At around £20 a square metre it is also relatively good value. 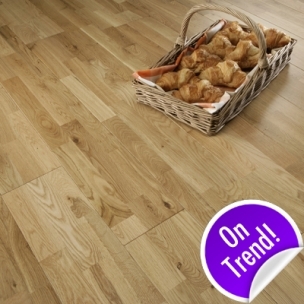 The most traditional wood floor, is solid oak - this Florence 3 Strip flooring is £17.41 a square metre. At around £31 a square metre, the Ipe effect Bamboo flooring provides a modern, dark look that matches up brilliantly with light coloured walls.